Yum! 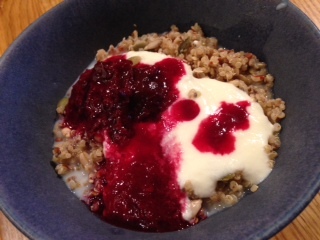 Thought I’d show you what a delicious breakfast I have – quinoa of course! I cook up a cup of plain quinoa on a Sunday and let it cool – it makes lots! I add 1/4 cup of sunflower seeds and 1/4 cup chopped almonds. I then add 1/8 cup chia seeds and linseed. A healthy sprinkling of ground cinnamon and a pinch of salt is added then I mix it all together. Put it in a big airtight container and keep it in the fridge. I have a few tablespoons each day. I always add a dollop of natural yoghurt, some stewed fruit (this is last Summers’ plums from the freezer) and a small amount of milk. It’s really delicious, so easy to prepare each day (as you’ve got the mixture in the fridge already!). SO much better for you than most other brekkie cereals and certainly better than toast (even though I do love hot fruit sourdough from the loker bakery, smothered in butter!). Give this amazing quinoa breakfast a try!